Joe Leach smashed 63 from 35 balls to help Worcestershire to a seven-wicket One-Day Cup victory at Yorkshire. Seven of the Yorkshire top nine reached double figures, but Gary Ballance's 30 off 32 balls top scored in 170 all out. All six Worcestershire bowlers took wickets, led by debutant George Rhodes (2-34), Jack Shantry (2-10), Leach (2-30) and Brett D'Oliveira (2-49). The visitors needed only 25.3 overs to reach 171-3 as Leach was assisted by Tom Kohler-Cadmore (42). Worcestershire's opening pair put on 107 for the first wicket in 12.4 overs before both fell within four balls of each other, but not before Leach had blasted 22 from one Tim Bresnan over. Joe Clarke (26) and captain Daryl Mitchell (23 not out) saw the visitors home to wrap up an emphatic victory. 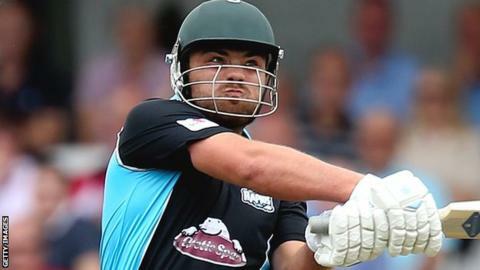 It was a second crushing victory for Worcestershire over Yorkshire inside a week, after the Pears' seven-wicket T20 Blast victory on 2 June. Yorkshire, playing their first One-Day Cup game of the season, struggled after electing to bat and Bresnan, who was last man out for 24, was the second-highest scorer of their innings. Rhodes, who has come through the Worcestershire youth system and is the son of the club's director of cricket Steve Rhodes, took the wickets of namesake Will Rhodes (17) and Alex Lees (19) in his tidy 10-over spell. The 22-year-old became the third generation of the Rhodes family to play first-class cricket - his grandfather Billy, who was born in Yorkshire, played for Nottinghamshire between 1961 and 1964. Yorkshire director of cricket Martyn Moxon revealed that injured pace bowler Jack Brooks could be out for up to a month with the leg injury he suffered bowling in the T20 Roses match at Old Trafford. "We have just got to bat better. That is the bottom line. Our batsmen have not got that confidence at the moment. "They are hoping rather than expecting and are not in their best form. There is a bit of fear of getting out as opposed to scoring runs. "But fair play to Worcestershire who have gone for getting the runs quickly and had the batsmen at the top of the order to do the job." "Jack and myself managed to get them in an early stranglehold and we were able to keep them quiet. "We put a foot on their throat and never let it off. Spin was difficult to play and George Rhodes was outstanding on his debut. For a lad to come in on a Test ground, with the game on TV, he played very well indeed. "I got a late nod to open the batting. It was felt that it was best for the top of the order to score quickly and put a dent in the chase. I was able to give it a tonk. There wasn't much culture."